The Tyler Train Kept a-Rollin’, All Night Long. And it’s a good thing for UCLA that it did, because 3 of the other frontline Bruins were tattered like Ragdolls, and not feeling in the Pink enough to play. So the Bruins were already Living On The Edge, when Tyler Honeycutt stepped up and successfully carried UCLA to The Other Side, in a 65-56 victory over Oregon State. 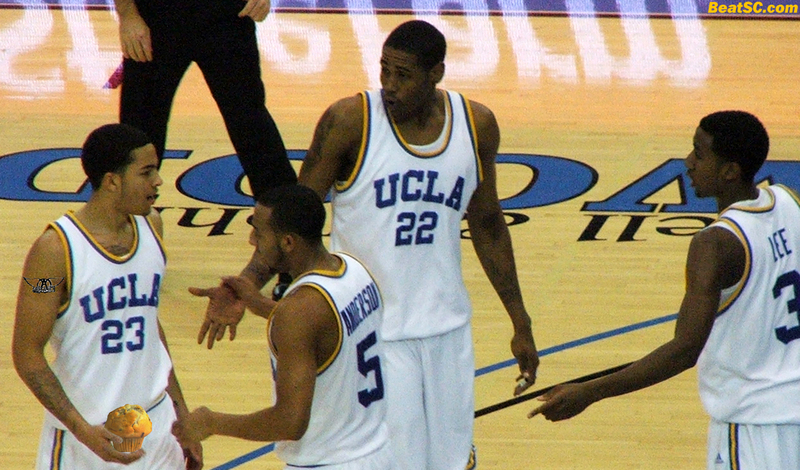 Center Reeves Nelson missed the game with an eye injury, Forward Brendan Lane missed the game with an ankle injury, and Center-Forward James Keefe was already out for the year with a shoulder injury, so the Bruins had only 8 scholarship players available, with only Honeycutt, Nikola Dragovic and Bobo Morgan having any size at all. Perhaps surprising to some Bobo supporters (and to some Jerime-haters), Ben Howland let LOGIC determine the new Starting Line-up, of Jerime Anderson, Malcolm Lee, Michael Roll, Honeycutt, and Dragovic, with Morgan on the bench. It was a wise decision, as the Bruins got off to a fast start, and they played better with that line-up than they did with Bobo in the game. The small line-up Bruins led for most of the 1st Half, despite getting dominated on the Boards, and despite Dragovic getting shut out for the entire Half. But with Anderson usually running the Point, the Bruins turned the ball over only 4 times, and they shot 53% from the field. It was 9-9 when the Bruins went on a 9-0 run to get some breathing room, and with Honeycutt contributing all over the court, scoring 11 of the Bruins’ first 24 Points, and with a big 4-point switch right before the buzzer, the Bruins took a 36-26 lead into the locker room. But Lee’s breakaway bucket (off a Honeycutt Rebound/outlet) as time expired did not translate into momentum after the break. Oregon State came back strong with a much more tenacious trapping Zone Defense, and a stronger determination to get the ball into the paint on Offense. The intensity of the Beaver Defense exposed the poor ball-handling skills of all the Bruin Guards, and the interior passing of the Beaver Offense exposed the poor defensive skills of the Bruin “big men,” especially under-sized Center Drago. Oregon State was able to cut the double-digit 2nd Half lead down to 1, at 50-49, with 4:42 left. But the Bruins didn’t panic. Despite their struggling against the frenetic D, their missing several Free Throws, and Roll going only 1-6 for the game (all from 3), the Bruins actually showed some composure (unlike usc, who BLEW a double-digit lead in a loss to Oregon Thursday night, scoring only 12 points in the 2nd half). In the final minutes, as the Beavers stayed within striking distance, UCLA kept making the big plays to stay in the lead. Late in the 2nd Half, the Bruins’ Zone Defense started forcing more perimeter shots (like they did throughout the 1st Half), and the Beavers just could NOT convert, going 3-20 from Downtown for the night. And on Offense, the Bruins were able to use patience (and bounce passes) to break down the trapping D and find open seams and open shots. Honeycutt was clearly the MVP, with a career-high 18 Points, 10 Rebounds, 4 Assists, 5 Blocks (also a career-high), and 3 Steals. He truly “did it all.” In the beginning of the game, he slammed in an emphatic Rebound Put-back; With his blocked shots, he kept Oregon State out of any Offensive rhythm; He hit both of his Three-point attempts, including one with 4:20 left, when the lead was just ONE; And right after that Three, he got a steal and made the feed that energized the crowd, and allowed the Bruins to regain control of the game. Speaking of flourishing, someone wrote in (a comment to the previous article) requesting some love for Darren Collison. DC actually DID get a mention here after his recent Triple-Double. But I neglected to mention that he joined the company of Oscar Robertson and Damon Stoudamire as only the 3rd Rookie in NBA History to collect at least 18 Points and 9 Assists in 6 straight games. Not bad for a back-up, thrust into a prominent role due to injury, huh? He stepped up when he needed to, exactly like Tyler Honeycutt. "STEAMIN’ TYLER" was published on February 26th, 2010 and is listed in Blue & Gold News, UCLA/usc/Cheerleader Photos.